Thank you Southwest Solutions for inviting RX for Reading to their Thrive by Five Community Open House! Thrive by Five is a federally-funded, early childhood education program designed to help families break the cycle of poverty. It incorporates Early Head Start and Head Start programs for children from birth to five and wraparound services including family support, parental skills training, and health and social service support and referrals. The UDM team! Renesha Smoot Grafton, Sandybel Quintana, Kristin Hnatio, Nancy VanRaemdonck, Erika Turak. Not pictured: Heather Bishop and Erin Henze. There was lots of excitement at the RX for Reading table! Renesha Smoot Grafton and and Sandybel Quintana wait for the families to arrive. UDM Assistant Professor of Psychology Erin Henze and UDM graduate and undergraduate students Kristen Hnatio, Nancy VanRaemdonck, Heather Bishop, Sandybel Quintana, Erika Turak, and Renesha Smoot Grafton represented RX for Reading at the Community Open House. 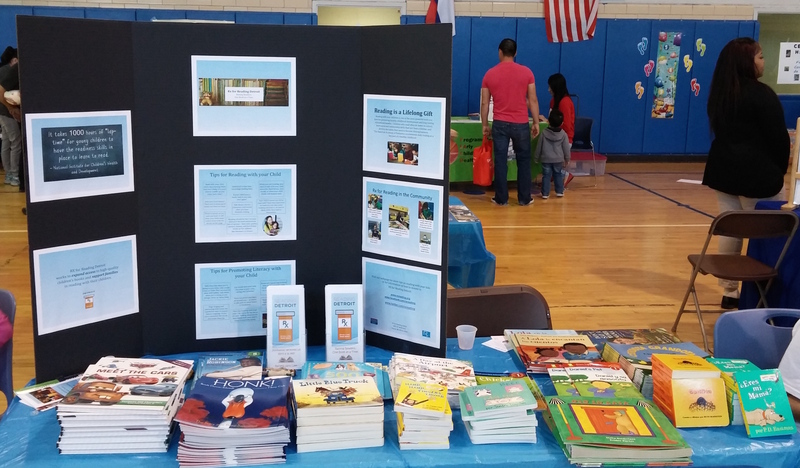 They distributed over three hundred new English and Spanish-language books to children and talked with parents about strategies for reading with children and promoting literacy. Thank you to Southwest Solutions for inviting us and to our incredible donors who allow us to provide new books for children in our community! ← What Happens When College Students and Preschoolers Read Together?